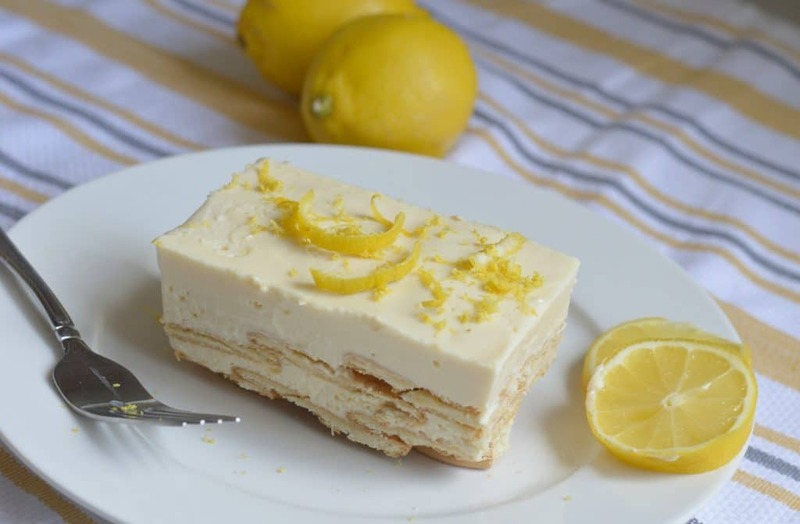 This Lemon Carlota recipe is a simple, delicious Mexican Dessert that looks pretty and will please even the pickiest of eaters. Keep reading to learn how to make it. Para Ver esta receta de Carlota en Español, Haz Click Aqui. A Carlota is a very popular Mexican dessert that has French roots. It is easy to make and, being that it is usually eaten either frozen or chilled, it is perfect for sunny days. It is also ideal for when you have people over and you don’t have a lot of time to prepare, because it really doesn’t take very long to make! A carlota is made with multiple levels of vanilla flavored cookies, covered in a sweet sauce, and is then frozen for a couple of hours to create a creamy ice cream like texture. 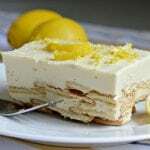 Sometimes this is called a lemon icebox cake, but I will always call it a carlota. My preference is to make it lemon-flavored, but you can make it with strawberries, apple, and peach too – which is the flavor that I ate a lot growing up. That is because I have an uncle in Mexico who worked in a restaurant and he made the most delicious peach carlota. He always used to make it around Christmas time to go with our Christmas dinner which became a great tradition and we all looked forward to it every year. Even though this is a very simple Mexican dessert, we shouldn’t underestimate its flavor, and you can rest assured that it will impress all of your guests. 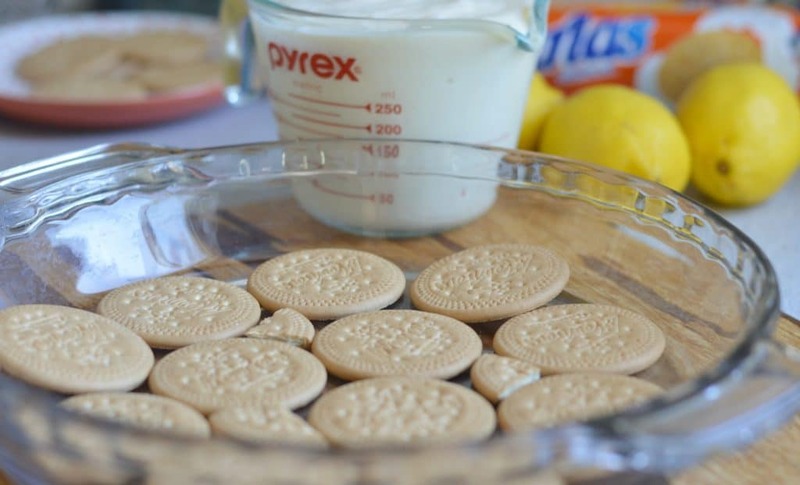 To make this lemon carlota you will need vanilla flavored cookies. The kind that are most commonly used in Mexico are called “Marias” and they can be bought almost anywhere down there. Here in the United States I have had a hard time finding them in a few places that I have lived, especially in my first few years here. Over the past few years, however, more and more Mexican products are being imported into the United States which means that you can find these all over the place now! I found mine in a local grocery store, but you can also buy them online here. Once the sweet sauce is prepared, it is time to put the cookies down one layer at a time in a baking dish, and then covering each layer with the sweet sauce until all the cookies are gone and you finish with a final layer of the sweet sauce. Once prepared, put the carlota in the freezer and then cut into pieces when ready to serve. If you decide to make this tasty Mexican dessert, don’t forget to come back and tell me how it turned out! 2 Packages of Marias cookies. 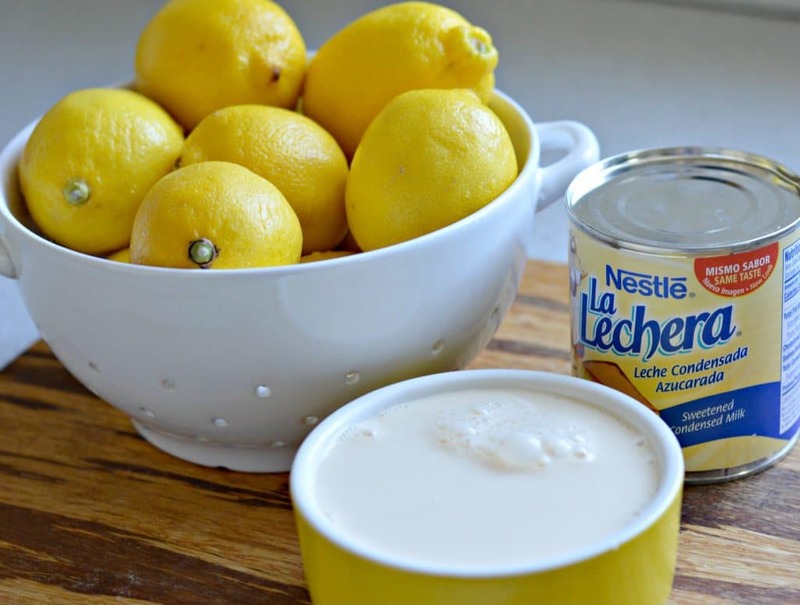 Blend the two types of milk together with the lemon juice and set aside. In an 8x8 glass baking dish, put one layer of cookies along the bottom, covering the entire bottom of the pan. Repeat until the cookies are gone, finishing with a final layer of sweet sauce. Freeze for at least 2 hours and serve! I made it today for Mexican potluck. to make. Let’s see how they like it! Oh my heavens; this looks so delicious!! I just had lunch about 20 minutes ago and my mouth started watering while reading the blog post, haha! I can’t wait to make it. I love chilled “icebox” type desserts and anything with a cookie layer that’s been soaked with something yummy!! Thanks Stephani! This is truly a delicious recipe, and it is so easy too. Good luck! Let me know how it turns out. Don’t you mean lemon juice? Thanks for catching that! Yes, it should say lemon juice in the ingredients and in the instructions. I have updated the recipe. What size pan do you use. ? Hi Pat – I use a 9.5 inch circular pan, but this would work well in an 8×8 square pan as well. Good luck! I am just curious about when you use Peach, Apple, Strawberries, etc INSTEAD of Lemons…….HOW MUCH FRUIT do you use?? I assume you crush, and blenderize the fruit to make it into more liquid, with some small bits of fruit??? I would like to know at least a starting estimate of fruit amount, please. I have in mind approximately 2-3 medium sized Apples, or Peaches, or ?? 1 1/2 cups of Strawberries ??? Please let me know ? Thanks. Darn it, I just had a thought. I believe that the acidity of the Lemon Juice is partly why this mixture thickens!!! So please advise if do you have to use the lemon juice either way???? Then, I guess you could either slice the fruit and add to layers, or just place on top ?? Or you could, slice fruit, and partially crush, even blend some or all of the fruit, and add blended fruit to milk mixture, and sliced fruit on top??? Hmmm, what do you suggest??? And again, about how much fruit should you add?? 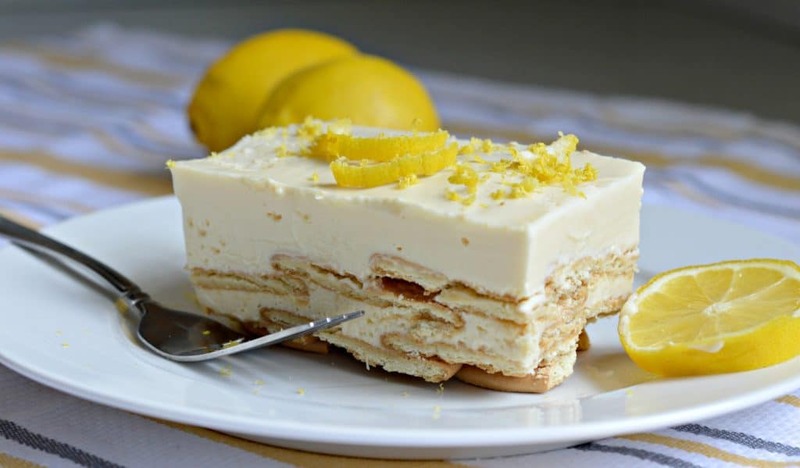 Hi Marcus – It has been a long time since I have eaten this with anything but lemon, and when I did, it was my grandmother that made it, so I am not sure about exact quantities. I think that the amounts that you are suggesting look good, as you really just want to make sure you have enough to get the flavor in there. I would suggest just blending whatever fruit you end up using with the sweetened condensed milk and evaporated milk until it it pretty smooth, and then following the directions as for the rest. I don’t think you necessarily have to add lemon juice, but it might not hurt to add a little bit. Let me know how it turns out! How many servings? Could I double for a 9×13? Hi Theresa – I just updated the recipe to show servings and serving size. In an 8×8 pan, this should make about 16 2×2 inch squares. If you double it, you can use a 9X13 inch pan, but you may have a little bit extra left over. Hi – could you let me know what size of cans are used for the milks and also what is the weight of the pack of cookies/biscuits? I’m in the UK and will be using an alternative biscuit. Hi Susan – the sweetened condensed milk and evaporated milk are both 14 ounce cans. The cookies are two sleeves of 7 ounces each, so 14 ounces total. Hi! I had to do this for my class Spanish project. I really like lemon desserts, so this was a really yummy treat for me. It was also quite easy for a kid like me to make this. I can’t wait to share it with my class! Thanks for making the recipe. Hi, I had to do this for my Spanish class. This dessert is super yummy and easy to make. I love lemon desserts and this is perfect. I’m sure my peers will enjoy this treat! 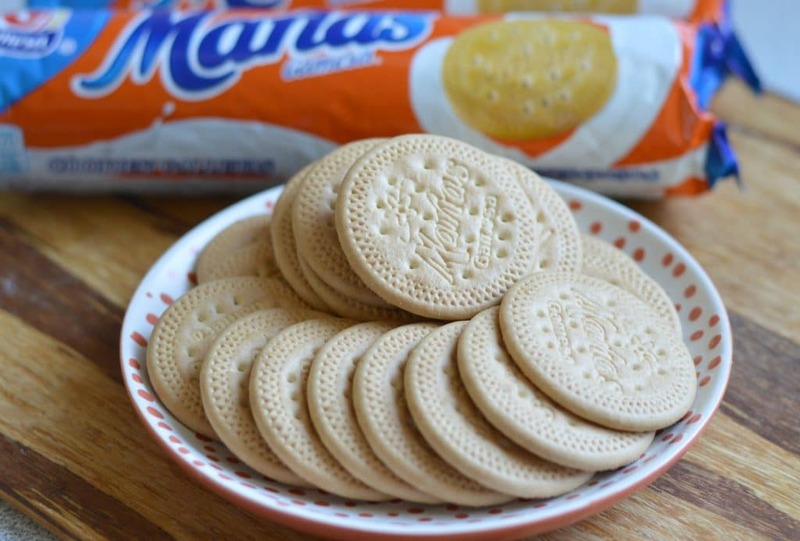 What is your favorite substitute cookie if we can’t find Maria’s?